Will Apple sweeten or sour sentiment with profit guidance after its Q1s on Tuesday? Home Shares and markets Investment Articles Will Apple sweeten or sour sentiment with profit guidance after its Q1s on Tuesday? “Investors in Apple – and technology stocks more generally – will be looking toward the company’s first-quarter results on Tuesday night for some reassurance after the profit warning on 3 January and the important numbers will not be those for Q1 but any guidance from boss Tim Cook about the second quarter and beyond,” says Russ Mould, AJ Bell Investment Director. “Judging by subsequent price action, investors have concluded Apple’s first-quarter stumble was just a blip. The Californian giant’s shares have rallied 11% from their lows to get back to where they started the year, while the Philadelphia Semiconductor Index, or SOX, which features many of Apple’s major component suppliers, is up 11% for 2019 to date and stands at a three-month high. “Using the mid-point of the revised guidance provided by Tim Cook on 3 January, Apple is expected to record an earnings per share figure of $4.16 for its fiscal first quarter. “That still represents year-on-year growth of some 7%, despite the 10% downgrades implied by the trading alert, but all of that increase comes from a drop in the tax charge and a lower share count following the company’s massive share buyback scheme. Source: Apple accounts. *Based on mid-point of prior guidance. “Sales and operating profit – the best signs of the company’s ultimate health – are both expected to be down year-on-year, the first such declines in two years since the drops suffered in Apple’s fiscal first quarter for 2017 (Q4 2016 on a calendar basis). “But this is largely discounted and the shares have even shrugged it off. What really matters now is the guidance provided by Mr Cook and his team for the second quarter and then the rest of Apple’s fiscal year. “Consensus forecasts are looking for a second-quarter sales figure of $59.7 billion, a 2.4% year-on-year drop and earnings per share of $2.73, flat year-on-year, helped by the lower share count that has resulted from Apple’s monster share buyback programme, which came to $72.7 billion last year alone. “The forecasts imply a 29% drop in sales from Q1 to Q2 and a 34% drop in earnings per share. 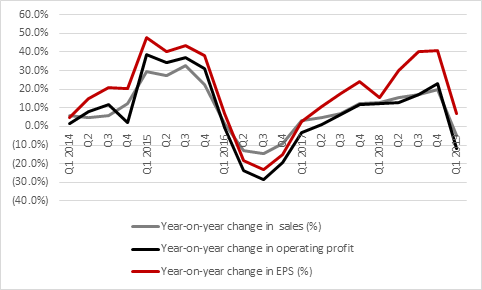 This may sound dramatic but neither number looks that unusual given the seasonality of earnings showed across the last five years and the importance of the end-of-year Christmas selling season. “As such, analysts currently seem content to assume that the Q1 was just a blip in smartphone sales, rather than a warning of saturation, market share loss and margin pressure in that market, with services and app sales taking up any slack. Investors seem to be buying that theory too, given how Apple’s shares are bouncing back, even if recent commentary from the supply chain, via companies such as Taiwan Semiconductor Manufacturing Company and France’s ST Microelectronics, on the face of it reads less positively than that. TSMC, for example, showed inventory of finished silicon chips and parts rising far faster than sales in its fourth quarter, which is usually not a good sign and one that suggests demand in end-markets is proving softer than expected. “Despite such mixed news flow, analysts are expecting Apple to get back on the growth track in its next financial year, with 3% growth in sales and 15% in earnings for the 12 months to September 2020. “If those forecasts prove accurate it is easy to see why Apple’s shares are going higher. “At $157, those estimates put the shares on 11.5 forward earnings for fiscal 2019-2020 with a dividend yield of some 2% and a balance sheet that still has $123 billion of net cash, compared to its $750 billion market cap.